Street-sellers ply their wares amongst the jostling crowds. There's a smell of stale beer and sweat, the clanking of tankards and raucous laughter. A horse whinnies, and a barrow rattles as it's pushed off the cobbled street. Then the sound of cheering and shouting as the Procession, with its colourful banners and streamers, turns out of High Street into Earl Street. People lean out of the upper-storey windows of half-timbered houses, their merry laughter and chatter drowned out by the 'root-toot-toot' of fifes and drums. Around the street corner comes the Captain of the Guards, sunlight flashing off the blade of his sword as it's held in front of him. He's followed by two Lieutenants, then City Guards - two and two - resplendent in their colourful uniforms. 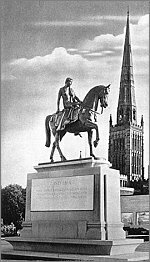 Next comes the man playing the part of St George, armed and mounted - those who watch know the tradition that the Saint was born in Coventry. Then four bugle horns - 'tara-tara '.After the horns comes another city streamer, waved back and forth in the bright morning air. Next the fifes and drums, whose strident sounds had already announced the Procession before it arrived. More Guards accompany the High Sheriff in all his dignity. There's a little space after that, and an expectant hush from the crowd. Then comes the person everyone has been waiting for - Lady Godiva. She is sitting side-saddle on a white horse with purple and gold trappings and is wearing a close-fitting white tunic and cloak, which covers all her body except for the legs. Walking on either side is the Town Crier and the Beadle. More streamers and banners are waved from behind. There's a rousing cheer from the crowd, and caps are thrown in the air. This was Coventry's Godiva Procession, which took place each year to proclaim the Great Fair. Some sort of procession probably took place ever since the Middle Ages when a Charter for the Fair had first been granted. But it wasn't until 1678 that we hear of Lady Godiva being associated with it. In that year she was first represented by a boy, then later by an actress or dancer. "Mount your horse naked, and ride through the market of the town ... and when you return, you shall have what you ask." He little thought his pious wife would ever do such a thing. But we are told that she rode naked through the town, letting down her hair so that her whole body was veiled except for her legs. And when she'd finished she returned to Leofric, who was so filled with admiration he granted to the people a charter of freedom. The citizens had agreed to stay behind their doors during her ride. No mention was made in the original sources of Peeping Tom, the "inquisitive" tailor who was supposed to have looked out at Godiva as she passed, being struck blind as a result. This part of the story was added on, it is thought, by 17th-century antiquary William Camden, who visited Coventry and was shown a wooden effigy purporting to be of the unfortunate tailor. The effigy, which still survives, is thought to be of St George. The Godiva Procession was held annually for a long time, then later every three or seven years up until the beginning of the 20th-century. It has been held less frequently since then, and in modern times it has taken on more the character of a carnival or pageant with tableaux on historical and industrial themes. The very last one to be held was in 1995 to celebrate the centenary of Coventry's motor industry. Godiva's equestrian statue is in Broadgate city centre. It is overlooked by the Peeping Tom effigy in the Cathedral Lanes Shopping Centre.